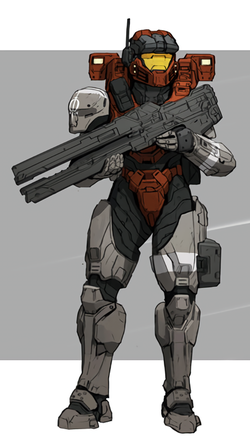 August-099 is a SPARTAN-II supersoldier and a member of Omega Team. Like the other SPARTAN-IIs, August-099 was abducted at age six and conscripted into the SPARTAN-II program in 2517. She later survived the augmentation procedures in 2525. Along with Robert-025 and Leon-011, August formed the Spartan-II fast reaction unit Omega Team. During the Human-Covenant War, Omega Team was deployed to many colony worlds threatened by the Covenant. On many occasions Omega Team worked closely with the members of Red Team (Jerome-092, Alice-130, and Douglas-042), including the defense of Arcadia's capital city Pirth when it was attacked in 2531. During the battle, they were separated when the UNSC Spirit of Fire departed the system to chase retreating Covenant forces. Decades later, Commander Jerome-092 discerned Omega Team had survived the war, based on UNSC records recovered from the Henry Lamb Research Outpost. A detailed concept sheet of August-099 for Halo Wars 2. August (center) alongside her teammates. August being used in multiplayer.